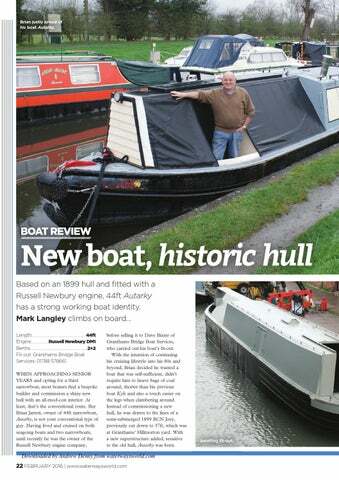 Brian justly proud of his boat Autarky. before selling it to Dave Bixter of Granthams Bridge Boat Services, who carried out his boat’s fit-out. With the intention of continuing his cruising lifestyle into his 80s and beyond, Brian decided he wanted a boat that was self-sufficient, didn’t require him to heave bags of coal around, shorter than his previous boat Kyle and also a touch easier on the legs when clambering around. Instead of commissioning a new hull, he was drawn to the lines of a semi-submerged 1899 BCN Joey, previously cut down to 37ft, which was at Granthams’ Hillmorton yard. With a new superstructure added, sensitive to the old hull, Autarky was born. This amazing narrowboat in the UK features an Envirolet waterless toilet in the bathroom.